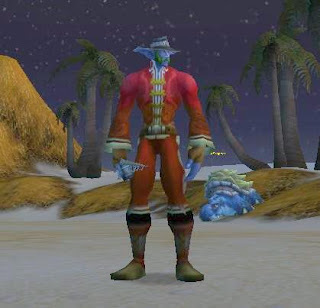 Some of the most profitable fishing locations in WoW are places where Glossy Mightfish are present. They live in the warm waters of Tanaris, Jaguero Isle in Southern Stranglethorn Vale, Feralas, Azshara, and The Hinterlands. Glossy Mightfish are used in cooking to create a great mid-level stamina stat-food. The Recipe: Cooked Glossy Mightfish will also level your cooking skill from 225 to 275. Since the release of Wrath of the Lich king, places where Glossy Mightfish are caught don't get visited often. The low supply in the Auction Houses makes them highly profitable fish, especially for your low level toons. The coasts of Azshara and The Hinterlands are dangerous for characters below level 45. Jaguero island, on the southern tip of Stranglethorn Vale, is treacherous for toons under level 40. Tanaris and Feralas, however, have many safe places to fish, even for a level ten (10) toon. If you have the "flight point" for the neutral Goblin city of Gadgetzan, Tanaris (in Kalimdor), and you're level 30+, simply fly to Gadgetzan, summon your mount and run east to the beach at Steamwheedle Port. You're mount can easily out run any of them. If you're on foot, expect a fight. 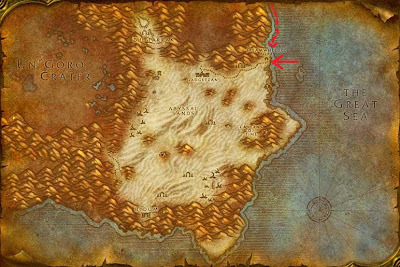 For Alliance toons: If you're below level 30 or don't have the Gadgetzan flight point, the journey to the shores of Tanaris requires a long swim from Theramore Isle, Dustwallow Marsh in Kalimdor. Theramore Isle has a flight point for Alliance characters and is an easy destination from any flight point in Kalimdor. To get there from The Eastern Kingdoms, take the boat from Menethil Harbor in the Wetlands to the pier at Theramore Isle. For Horde toons: There is no "safe" method to get to Theramore Isle in Dustwallow Marsh. Besides, you'll be KOS anywhere near the fort city. Brace yourself for LOTS of swimming. "most profitable fishing locations in WoW are places where Glossy Mightfish are present..."
If you already have a Strong Fishing Pole, Captain Rumsey's Lager and plenty of lures, then jump off the pier and swim for the southern shore of Dustwallow Marsh. Just follow the coast line south to Tanaris for about ten (10) minutes. Don't stray far from the shoreline. Coral Reef Sharks swim off the coast and have incredible radar for easy meals (like a level 10 toon! ), but they stay off shore and will not bother you along the coast line. Once you get to the beach in Tanaris, relax, get your fishing pole, add your fishing lure, have a swig or two from your Captain Rumsey's Lager and cast your line. The minimum fishing skill needed to NOT catch junk is about three hundred (300). I brought my level twelve (12) and nineteen (19) toons here with a fishing skill of just 175. With less than 175 fishing skill, you will catch plenty of sickly fish, tangled fishing line, tattered cloth, driftwood and the occasional old boot. Luckily, there is a fishing hut nearby, in Steamwheedle Port, with a friendly goblin, Gikkix, who will buy all the junk you catch. These Mightfish easily sell for 2 or 3 gold each in the Auction House. They have a catch-rate of 10% in Tanaris and Feralas. They are in great demand because they're used to create a great "stat" food which adds +10 to your stamina for ten (10) minutes. Cooking Raw Glossy Mightfish is a great way to raise your WoW cooking skill from 225 to 275. If you use this recipe to raise your cooking skill to 275, you will have plenty of stat food to eat and sell in the Auction House and recover the cost of buying Raw Glossy Mightfish in the Auction House. These Yellowtail usually sell for 1 or more gold each in the Auction House. They have a catch-rate of nearly 50% in Tanaris and Feralas. They are in good demand because they're used mostly for raising WoW Cooking skill from 225 to 275 using Recipie: Spotted Yellowtail which heals players for 1392 health over 30 seconds. The cooked fish usually sells in the Auction House for more than the vendors are willing to pay. Fish and cooked fish are needed for Hunters to feed their "Bird of Prey" pets. Raw Summer Bass is a seasonal fish that is replaced by Winter Squid in the "off" season. They sell for 1 or 2 gold each in the Auction House. They have a catch-rate of about 10% in Tanaris and Feralas. Both Raw Summer Bass and Winter Squid are popular items in the Auction House because they are used to create stat food with +10 to spirit or +10 to agility respectively. They can also help raise your cooking skill from 240 to 290. Not only will you have a full supply of stat food for yourself, you'll plenty left over to sell in the Auction House. Big Mouth Clams are a fun bonus item from fishing in Tanaris. About 10% of the time, they contain Black Pearls. One hundred percent (100%) of the time, Big Mouth Clams contain Zesty Clam Meat which sells for 1.5gp each (more or less) in the Auction House. Zesty Clam Meat is a component in the Recipe: Undermine Clam Chowder and the recipe: Clamlette Magnifique. Clamlette Magnifique is a great stat food adding 24 Attack Power and 14 Spell Power for one (1) hour. Because it is a common drop from many mobs, the ready supply of Zesty Clam Meat usually keeps the Auction House market price relatively moderate. Raw Rockscale Cod are the least valuable of the fish caught in Tanaris, but they are great for getting your cooking skill from 175 to 230. These cod are present everywhere Glossy Mightfish live. Demand in the Auction House stays steady, but I rarely sell these for more than 6gp per stack. Personal note:The beach in Tanaris is consistently my favorite, most accessable, and most profitable fishing spot. It's by far the safest. The big turtles on the beach are friendly and the nearby vendors make it a very practical fishing hole. Because WotLK is the "hot" content now, the waters in Tanaris are greatly under-fished. In fact, all the waters where Raw Glossy Mightfish are caught are also greatly under-fished. 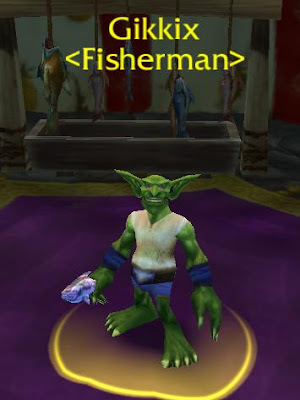 The release of Wrath of the Lich King and Burning Crusade have certainly created this profitable fishing opportunity. Tip: Getting smacked down by any mobs near the beach will respawn you at the graveyard just outside the neutral city of Gadgetzan. Accept the resurrection at the graveyard and make your way to the Flight point just outside the city walls.